An artist’s conception of the village core of the Safari Highlands project. 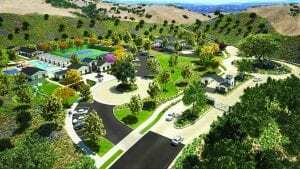 The public comment period has begun for Safari Highlands Ranch (SHR) a proposed $450 million development by Concordia Homes on 550 luxury house lots east of Rancho San Pasqual. As the name would imply, the development is only a couple of miles from the San Diego Safari Park. The total project is 1,098 acres, including 700 acres of open space. This is a project where the developer, Concordia, is requesting that the city of Escondido annex land that it is currently in the city’s sphere of influence. Safari Highlands Ranch is undergoing review under the California Environmental Quality Act (CEQA) after which time the city council will vote on it. The developer expects a final decision by 2018, and if the council approves, construction beginning in 2021, with full build out in five to six years. Concordia Homes has been building homes since 1977 when Randy Hall founded the company. It has built about 10,000 homes in Southern California and has been building in San Diego County for about 20 years. The proposed home lots will range from 10,000 square foot to one acre minimum. Seventy percent of the total property will be set aside for permanent open space. There will be nine miles of trails that will be open to the public, although they won’t as yet link to any established trail system. They could eventually be connected to regional trails, but that would require a donation of private property. Concordia says that its project will, besides creating $514 in total economic impact and 5,739 local temporary construction jobs, generate $53 million in total economic impact annually. The project says the developer will create a new, alternative northern emergency evacuation access road and a built and equipped 7,000 square foot fire station for the Escondido Fire Department, at no cost to the city. The developer claims, “Property taxes generated by the new homes will provide the majority of funding needed to support ongoing operations at the fire station.” It will also, says the developer, up the safety of surrounding residents by providing a functional fire station in their midst. It will also provide about $3 million to the San Pasqual Union School District (SPUSD) for capital improvements through development fees. The developer is proposing to fund a new on-campus pick-up and drop off at San Pasqual Union School, at the district’s discretion and to create a safe route to school with a new crosswalk on Rockwood Road. Because the school district currently uses about 180 inter-district transfers to maintain its current enrollment, Concordia asserts the 136 students it will contribute to the district, and will not increase the overall student population because the district would cut the number of inter-district transfers. While inter-district transfers will be reduced, no students currently attending the school would be kicked out. Students from Safari Highlands Ranch would enroll into the school at about 30 students per year as the community is built. The developer asserts that it will “maintain the current level of service on the nearby roads and will provide approximately $4 million in fees for additional improvements outside the project area. In addition to these fees, specific enhancements will include a new traffic signal at Rockwood & Cloverdale roads, restriping to add a second westbound lane on Rockwood Road turning south at the intersection, and a median along Rockwood Road from Cloverdale Road ending before San Pasqual Union Elementary School,” without eliminating any parking. A bird’s eye view of the project’s entrance and some of its amenities, such as a clubhouse, tennis courts and swimming pool. the flow of traffic. The developer also proposes to design and pay for a new drop-off and pick up improvements including additional parking at the school to reduce congestion and increase safety. Part of the project would be a benefits package to enhance the existing Eagle Crest Golf Course. Of course, residents of the new development would then be able to join the country club—without Concordia having to build a new one from scratch. Concordia proposes to build or fund a new 4,000 sq. ft. clubhouse designed to include locker rooms, bathrooms indoor/outdoor dining area, pro shop, bar and restaurant. Currently the residents are using a trailer for the clubhouse. 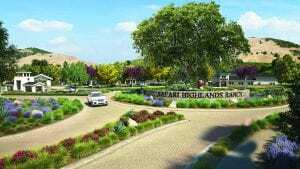 “The project team will work with the Eagle Crest golf course to develop a signature hole for the course at Hole 14,” says a spokesman for Safari Highlands Ranch. The design would include a water feature with a small waterfall. The project will also purchase 275 new annual memberships to the golf course. It will also contribute $200,000 to be used for additional course improvements. Note: The Times-Advocate is committed to providing both sides of issues affecting the community. Persons who oppose Safari Highlands Ranch are invited to contact the editor at editor@times-advocate.com so that an interview can be arranged.